I wanted to call each and every one of you to tell you about this cake the minute I ate it. It was that good. We baked it when my husband’s nieces, who now I just call my nieces, my sisters, my dear sisters, were here. The house was warm with their laughter, their helping hands in the kitchen, their midnight chitchat in bed and their little quarrels. Oh how I miss their chitchat with me in the kitchen and even their quarrels! They reminded me of my older sister and I.
I loved our obstinacy to have dinners on the deck under pouring rain, laughing out loud at our “moist” salad. I loved our dinners on the deck under hungry mosquitoes, spraying and itching in pain. I loved our afternoons run to the near by supermarket to buy ice cream. I loved our expressions when we had our first tastes of Durian and then the second and third, and the look on our faces when we drove back home with this stinky fruit in the trunk of our car. I drove you crazy with my fake Pad Thai and your uncle with his charred-pseudo-grilled- shrimp. Remember? I remember. I remember how happy I was to have you in my house, in my kitchen. 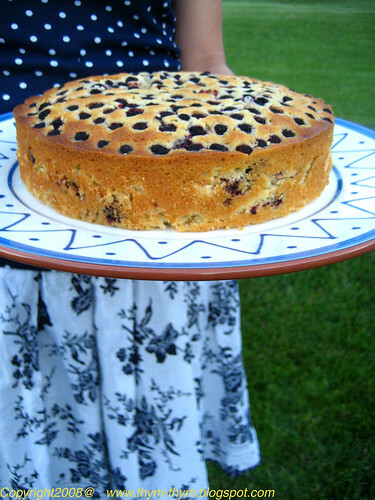 I remember how we enjoyed going to the backyard to pick black raspberries and to make this cake together, which I chose to make, you agreed to help and we all loved to eat greedily, blissfully, peacefully, sitting on the countertop. I remember how sad I was to drop you at the airport and how hard it was to say goodbye and to let you go, my dear sisters. I was drawn by this cake more than any other cake in Jamie Oliver cookbook mainly because the use of olive oil in the batter intrigued me. I’ve heard about this odd combination before but never had the courage to give it a go. What a waste of years! All my life I’ve been dipping bread in olive oil, which isn’t a bad thing either, when I could have used it to make this cake. This is pure genius. The olive oil gives richness and moisture and most importantly depth of flavor to the cake that no other vegetable or canola oil or even butter would have given. The crumb is light and the berries are just drenched in this lovely aroma of citrus and olive oil. The cake can be whipped up in ten minutes without even using a stand mixer. Weeks later and I still have the taste of this lovely combination in my mouth. Still have the lovely voices of my sisters in my heart. Preheat the oven to 350F. Generously butter a 9-inch pan and line the base with waxed paper. Set aside. Either by hand or in a the bowl of stand mixer fitted with the paddle attachment, whisk the eggs and sugar until thick and pale yellow, about 3 minutes, then add the butter, olive oil, milk, lemon and orange zest and vanilla. Mix well, then mix in the flour, baking powder and salt until everything is thoroughly blended. Set aside for 10 minutes for the flour to absorb the liquid. 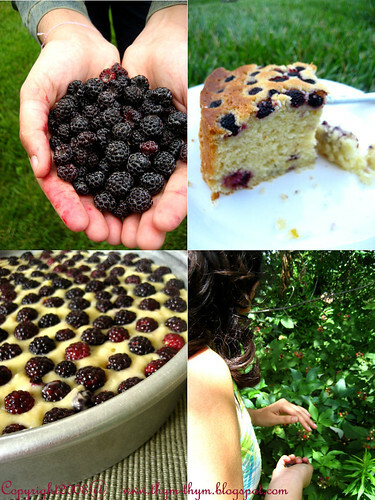 Stir about a quarter of the berries into the batter, pour into your prepared cake pan, and scatter the rest over the top. Bake the cake for 45- 55 minutes, or until the top is a deep golden brown and a toothpick inserted comes out clean. Let it cool on a wire rack in the pan for 10 minutes, then run a knife along the sides of the pan to turn it out. The cake can be stored at room temperature, wrapped, for up to four days. It is even better on the following day. Préchauffer votre four a 160C. Beurrer génereusement un moule à gâteau de 22cm de diametre et garnir le fond de papier sulfurisé, puis mettre de côté. Avec un fouet ou à l’aide d’un mixeur, battre les oeufs avec le sucre jusqu’à ce que le mélange devienne épais et d’une couleur jaune pale, environ 3 minutes. Ajouter le beurre fondu, le lait, l’huile d’olive, les zestes et la vanille. Bien mélanger puis ajouter la farine tamisée, la levure chimique et le sel et incorporer jusqu’à obtenir un mélange homogene. Ne pas trop mélanger. Laisser reposer 10 minutes afin que la farine absorbe un peu du liquide. Incorporer le quart des fruits à la pate, verser dans le moule préparé et mettre le reste des fruits sur le gateau. Faire cuire 45-55 minutes, ou jusqu’à ce que la surface soit d’une belle couleur dorée et qu’un cure-dent inséré en ressort propre. Laisser le gâteau refroidir dans son moule sur une grille patissiere pendant 10 minutes, puis passer un couteau autour des bords du moule et démouler. Ce gâteau se conserve à temperature ambiante, couvert de film plastique, jusqu’à quatre jours. Il est d’ailleurs meilleur le lendemain de sa cuisson. What a beautiful cake! Thanks for sharing! Well, it looks absolutely stunning - so it's not hard to believe it tasted delicious, too! Oh my!!!! How wonderful to be sooooo loved!!! Warda-Rose you have a beautiful heart, a beautiful soul and such beautiful prose and writing style. What a pleasure to be invited into your warm, exciting home through your blog and experience what your sweet nieces experienced, and what you family experiences every day!! You are all so blessed. One can never love enough!! This cake sounds wonderful. Another recipe for me to try as I empty out my grocery cupboards in preparation for our move!! And your photographs are a delight. Well done. It was worth the wait..........Hugs from me to you!! What is the size of the cake pan you used? BEAUTIFUL! I wish I could have a bite of that cake right now....sweets are my downfall. I am so glad that I found this blog....you are such a wonderful person, and I love how you write - with such joy, and love and care for those around you. You also take beautiful pics! Olive oil cake is truly food of the gods. What a lovely recipe. And what a lovely tribute to your nieces - it sounds like you had an absolutely delightful visit! What a wonderful story and I've read it twice now! And the cake...gorgeous! Your niece is the perfect model for these photographs -- beautiful patterns of her dress, the table, the cake -- a lovely study in blues! wow! this looks great. perfect for tea. and i love how large that slice looks. Your love for your sisters is evident! And the cake is divine! I remember seeing this recipe in the book and thinking it looked nice. But your cake looks amazing! What lovely, lovely photos. Anna Del Conte has an apple cake recipe in one of her books which uses olive oil. I made that once and was similarly suprised at how wonderful the olive oil tasted in it. Beautiful - I want to make the cake just from looking at the pictures! I love your beautiful discription of enjoying time with your family. 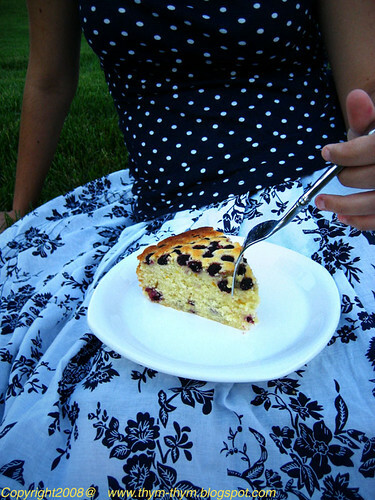 The blackberry cake sounds great and I love the skirt and top in the pictures. Warda, by looking at these amazing photos, I can see why all the fuss for the cake is about! It looks delish! this cake sounds delicious I love the ingredients but best of all are the photos they are great and the outfit is beautiful and the baby hands are the best. 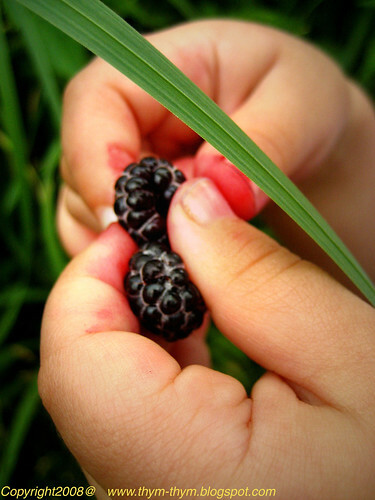 Maybe I loke the baby hands the best because I know how the baby feels about the blackberries. wow!! seriously, I wouldn't have minded a phone call to hear about this cake! It looks so bright and the fresh berries on top look divine!! It sounds like you all had a blast! Look utterly scrumptious! Great use of summer berries. I have always been intrigued by cakes with olive oil. I make biscotti with olive oil and love their texture. My nephew has blackberry bushes near his home and I think this is how we should use them. Beautiful photograph. Thanks! Beautiful! The photos are just stunning and the cake sounds great. And what a wonderful family gathering, I feel like I was there! Merci! J'ai vraiment votre histoire. Il me semble une maison francais rustique en printemps! Je regret, mon francais est en peu rouille! J'aime beaucoup la robe de ta nièce ! Et ce gâteau...Miam ! What a beautiful post, and a beautiful cake. The photos are superb--love the dress! Stunning! that cake looks amazing!! I too have been afraid to try olive oil in baked goods - despite having a cookbook for exactly that! But your description has overcome my fears - this looks too good to pass up! I love this! It is so rustic and gorgeous looking! Warda, I just made this cake last night and brought it into work today. It has been DEVOURED! And it's not even 9:30 yet! Someone gifted me with a big box of blackberries that she had picked....so I had to make the cake. - Mona, I am so glad, so glad you and your colleagues enjoyed it! And so sweet of you to share it with them. What a wonderful way to start the day at work. Thank you for the message and for making my day even better. Have a wonderful weekend! Looks good enough to eat...going to give this one a try perhaps this weekend. Blackberries are coming on right now, here. That cake looks amazing, and that dress! That dress, that dress! I LOVE it. Thanks so much for sharing, I made this yesterday with spectacular success (although I changed the recipe a bit). I love this cake! I use grapes and what a delight it is! I made this along with the chicken/olive tajine -- though we ended up having it for tea in the afternoon, too. For guests, I would highly, highly recommend making it one day in advance: it is super fragrant and much moister the day after. Un succes fou! I made it in my slow-cooker, actually, because my guest and I were out in the forest all day. It was delicious. And I even found the turmeric in an organic foods shop! I missed having some good bread to go with it, though (Lithuanian dark rye bread just didn't sound good to me!). So now I have to learn to make my own! Recipe? Oops! Hee hee! J'avais cru voir que j'ai commente dans la mauvaise fenetre! Beh, au moin tu as compris! Merci pour les recettes, d'aujourd'hui et demain! Oy! Et maintenant je commente avec le mauvais "username"! - Anonymous, I love to hear constructive advices, so please don't hesitate! There is always room to improve.